The type of treatment required will vary with each patient and it is possible that a patient could be treated more than one way. This is why it is so important that once having been diagnosed with an Acoustic Neuroma the matter should be carefully and openly discussed with your Ear, Nose and Throat (ENT) Specialist. In some instances a recommendation may be made not to proceed with treatment but to monitor the progress of the acoustic neuroma over a period of time: this is often in relation to the elderly or people with small tumors. Watch and Wait is also called Wait & See or Observation. Because Acoustic Neuromas are benign, not cancerous and usually grow very slowly or not at all, immediate treatment may not be necessary. Doctors often adopt a Watch and Wait approach and monitor the tumor's progress with periodic/annual MRI scans. If the tumour does not grow then not treating it may be the best option. If however the tumour does start to grow then intervention may be called for and a method of treatment will be will determined between you and your doctor. This has been more or less standard treatment for small tumours and for those who develop Acoustic Neuromas in later life where the risks of treatment may outweigh the risks of not treating the tumour and seeing how the tumour develops. There is an alternative line of thinking that it may be better to treat the tumour when it is small before it has a chance to grow and impact on facial and hearing nerves. While the tumour is small its impact is relatively small, but as it grows it places increasing pressure on the facial and hearing nerves. This can lead to facial numbness and a decreased hearing on the side with the acoustic neuroma. This alternative line of thinking is based on the idea that if the tumour is treated before there are any side-affects (hearing loss) there can be a better long term outcome than if the Watch & Wait approach is taken. Every case is different and the decision to adopt for a Watch & Wait approach or seek immediate treatment will depend on many circumstances and must be discussed with your doctor. Over the years considerable improvements have been made with regard to all surgical techniques including the removal of acoustic neuromas. Microsurgical instruments and the operating microscope are routinely used and damage to the surrounding nerve tissue has been considerably decreased and the mortality rates are extremely low. The facial nerve function is now routinely monitored during AN surgery, which has significantly reduced the risk of facial nerve injury. Cochlear monitoring is also used during surgery where there is a possibility of preserving the hearing. There is more than one microsurgical approach that can be used to remove an Acoustic Neuroma tumour. The approach used is determined after considering the patient's age, the size of the tumour and the level of useful hearing that is present in the affected ear. If the tumour is small, less than about 1cm and the hearing is good, then it is reasonable to try to preserve the hearing. For tumours that are mostly confined to the internal auditory canal, an approach via the middle fossa may be appropriate. For larger tumours extending into the posterior fossa but generally less than about 2cm, the retrosigmoid approach may be used. Where the hearing is absent or there is so little worth preserving or the tumour is too large to allow hearing preservation, then retrosigmoid or translabyrinthine approaches may be used. The latter entails drilling out the inner ear or labyrinth for access to the tumour and this approach alway leads to a 100% loss of hearing in the affected ear. 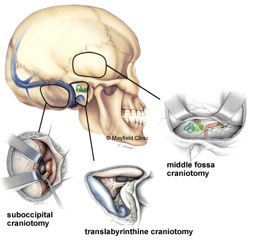 See diagram on right for a comparison of the three surgical entry points into the scull. Beside the obvious priority of maintaining life, there are three other surgical priorities. The first is preservation of the facial nerves to maintain normal facial function. The second is to preserve the current level of hearing and the third is total removal of the tumour. It must be remembered that because of the proximity of the AN tumour to both the facial and hearing nerves, total removal of the tumour carries a higher risk of damage to both these nerves and may not be in the best long term interest of the patient. Research indicates that near total removal of the AN tumour has similar re-growth outcomes to that of total removal. 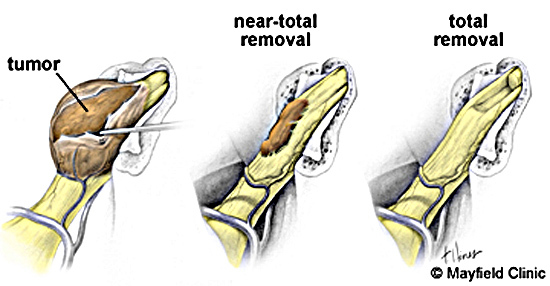 Near total removal also has significantly lower risks of facial nerve damage. If the AN tumour does regrow, radiation treatment could be used to treat the tumour. See diagram on right for comparison of full and partial removal. While the short term results of partial tumour removal seem to have better preservation outcomes for facial and hearing nerves when compared to total removal, the long term outcomes are still to be determined. The treatment plan for any particular person will be based on many factors, including age of the patient, tumour size and current hearing level. It is essential that you discuss all options with your specialist before deciding on any form of treatment. 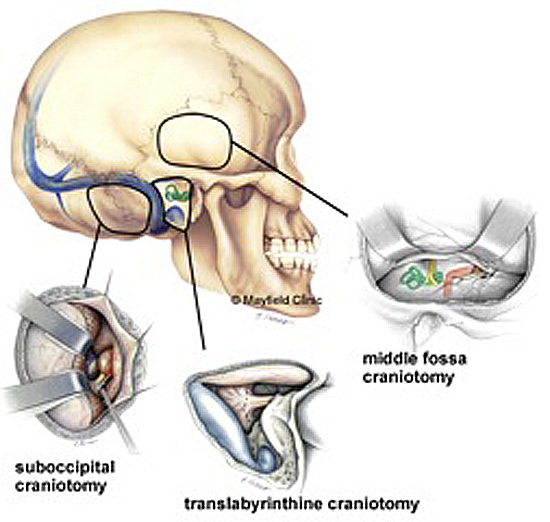 Comparison of the three surgery method entry sites into the scull. Radiation treatments come in several forms and can use different methods to generate the radiation used to treat the acoustic neuroma tumour. Overall the methods are similar but can vary in the number of treatments required. All methods maximise the radiation directed into the Acoustic Neuroma while minimising the amount of radiation to the surrounding tissues. Below is a summary of the main forms of radiation treatments available. Stereotactic Radio Surgery gets it name from the fact that the radiation is provided from many different points around the patient with almost the same precision as a surgeon's knife. Like conventional micro-surgery, Stereotatic Radio Surgery is carried out in one session, though the actual planning and setup may take some time. Because sufficient radiation is used to treat the AN tumour in one session, this by necessity requires relatively high levels of radiation when compared to 'fractionated' (Radiotherapy) treatments where the radiation is given in a number of (fractionated) sessions. 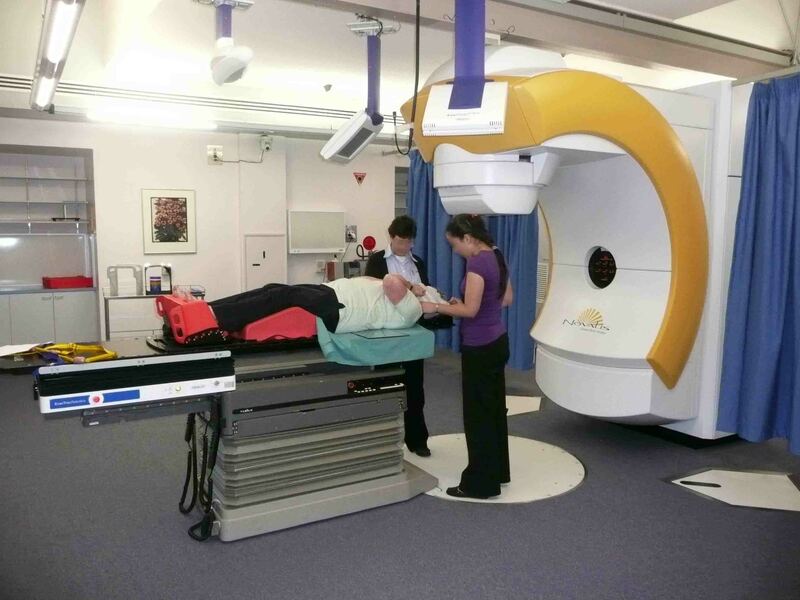 All radiation treatment options require a point of reference to accurately target the radiation on to the AN tumour. 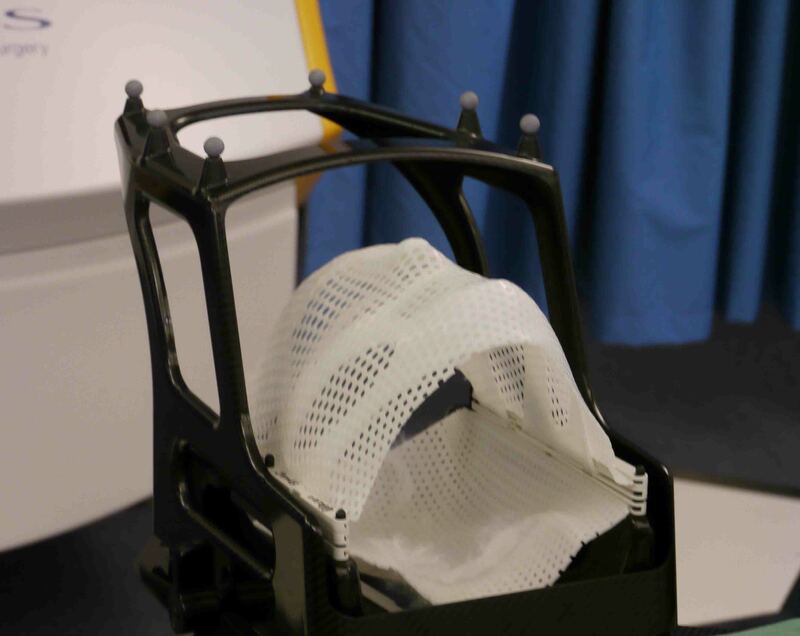 Most systems use a head 'frame' which is custom made for each patient, and in conjunction with CT and/or MRI scans accurately determines the AN tumour's location, size and shape with respect to reference points on the 'head frame'. As the radiation has to be repeatedly focused on the tumour, it is imperative that the patient's head be in exactly the same position for each dose and that the patient's head remain perfectly still whilst being treated. This is accomplished by fitting a head frame or mask to the patient which provides both a point of reference and holds the head perfectly still. These 'frames' are custom fitted specifically for each patient using the information obtained from the CT and/or MRI scans. 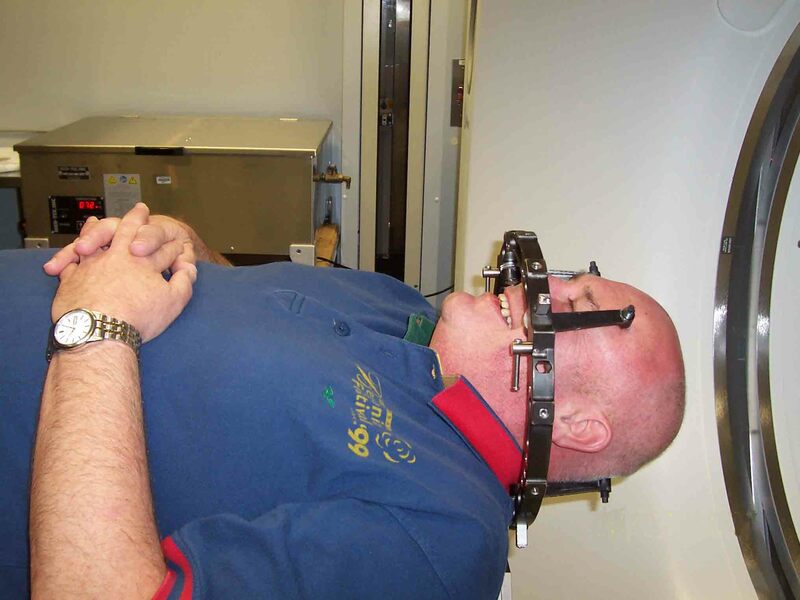 Two types of 'frame' are used, with some hospitals using a metal frame that is screwed to the head whilst others use a plastic face mask that is tailor fitted to each patient. Planning the radiotherapy treatment is one of the most important phases of the treatment process and requires a great deal of skill to carry out successfully. 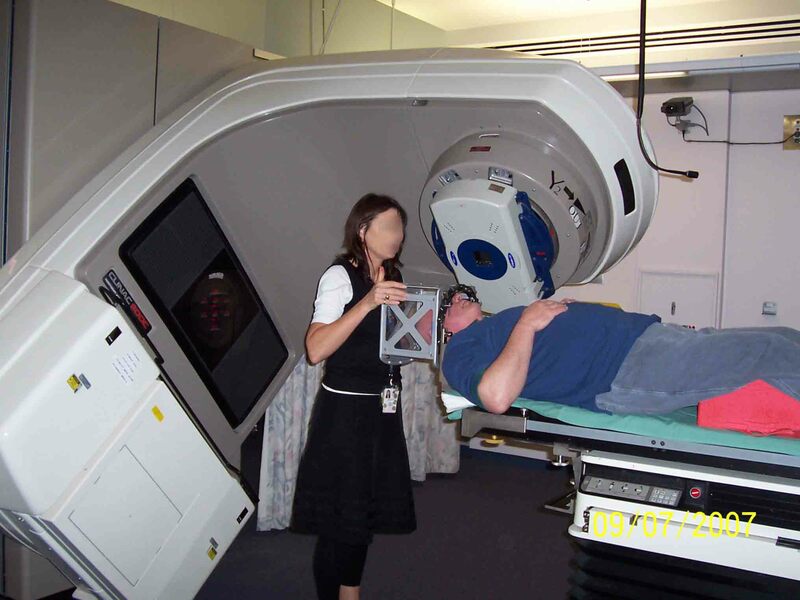 With the patient wearing either the metal head frame or the plastic face mask the radiation oncologist takes CT and/or MRI scans to exactly locate the AN tumour with respect to the 'frame' being used. This process also determines the tumor's exact shape and size so that the shape of the radiation beam can be configured to ensure that it exactly fits the AN tumor. It is this precision radiation beam shape that ensures that the brain tissue surrounding the tumour receives minimum radiation, thus ensuring minimal side effects. Planning the stereotactic radio treatment and making/fitting of the head frame or mask is the most consuming part of the process. The actual treatment phase is relatively quick. Gamma Knife is a method of treating acoustic neuromas using cobalt radiation rather than surgery. It is called a knife because it has the precision of a surgeon's knife. The technology delivers extremely focused radiation beams to tumours with minimal impact on surrounding tissue. The machines 192 radioactive beams are focused on the target tumour and the shape and dose of the radiation is optimized to hit only the target without damaging surrounding healthy tissues. As each individual beam delivers minimum radiation is only where all the beams meet that there is an effect. The advantages of gamma knife over other acoustic neuroma treatments is that the treatment is completed in one day and patients can usually return to work, drive and continue normal life within a few days. 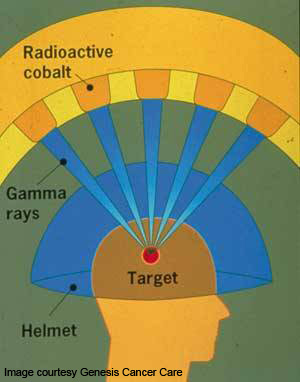 Radiation from the Gamma Knife is directed very specifically at the acoustic neuroma tumour therefore sparing the rest of the brain unnecessary exposure. The side effects are minimal and the risk of facial palsy or numbness is extremely low. The disadvantage of Gamma Knife treatment is that the tumour is not removed. The aim of treatment is to stop the tumour from growing and causing further damage. The tumour will start to shrink over many years. Treatment with Gamma Knife involves application of a stereotactic head frame, which is attached to the head with four pins. 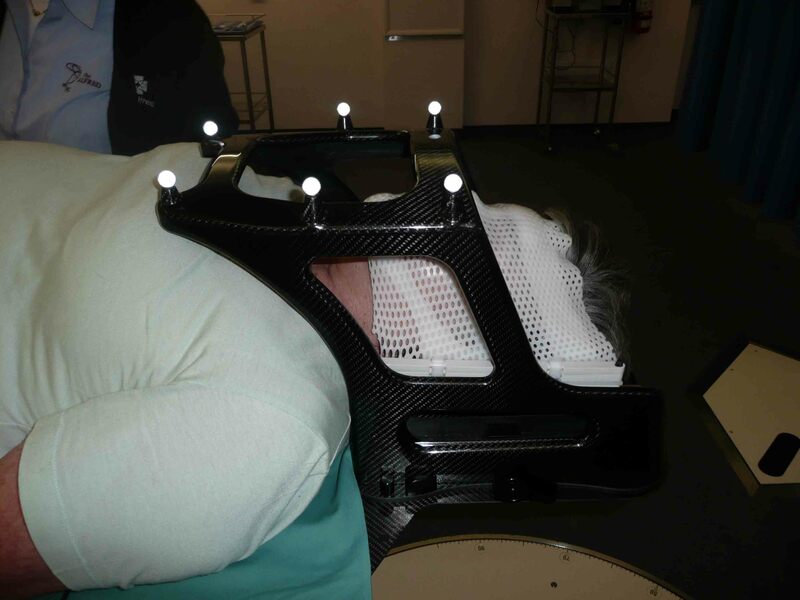 The head frame is lightweight and local aesthetic is applied where the pins are attached to the patients head. After the head frame is in place the patient has an MRI and CT scan with head frame providing reference points on the images for the treatment plan. 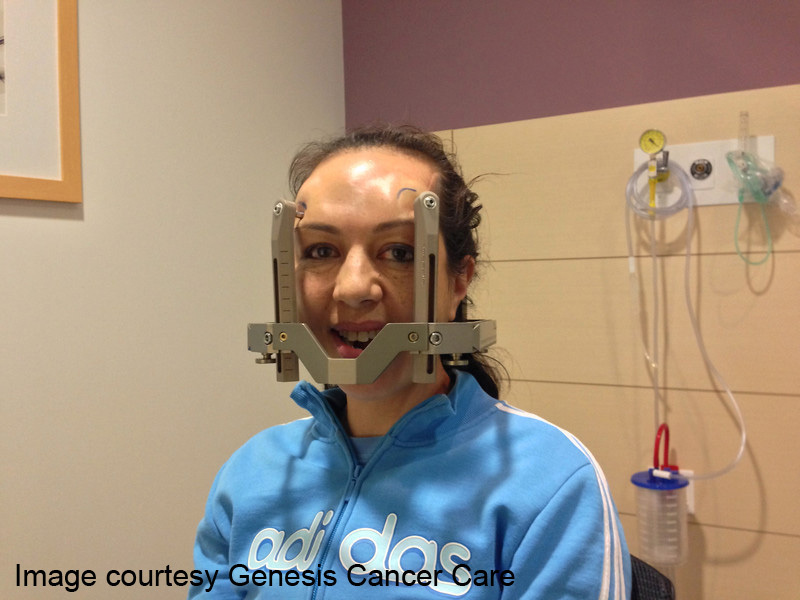 The treatment team then prepares a very accurate treatment plan to treat the acoustic neuroma tumour. The treatment is not painful and the patient is monitored by closed circuit television and an intercom system provides voice communication between the patient and medical staff. 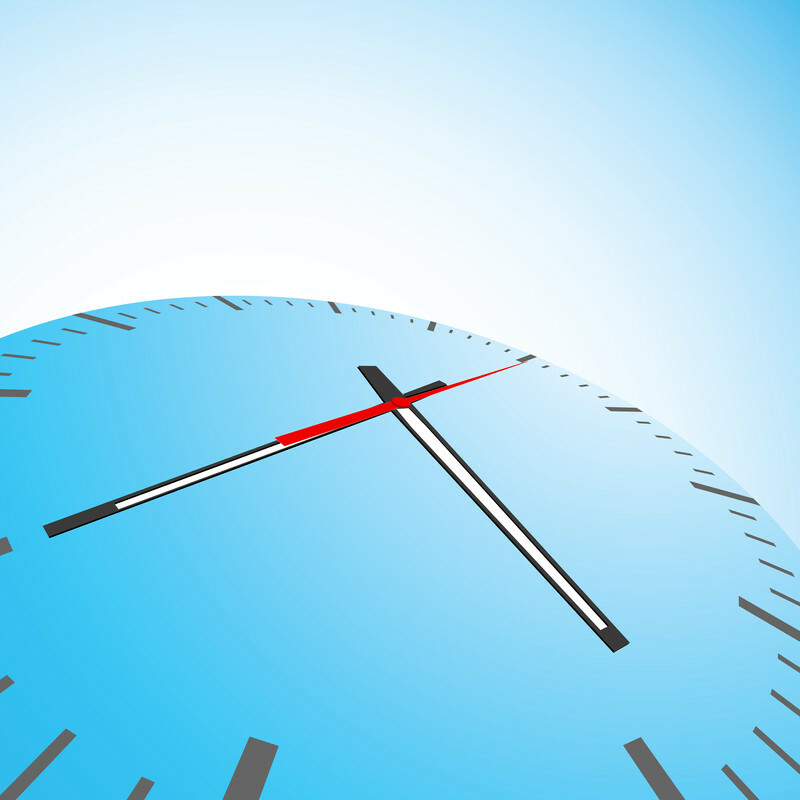 The length of the session varies depending on the size and shape of the tumour with an average treatment time of about one hour. The success rate of this treatment in controlling acoustic neuroma growth is greater than 97% and in many countries including the UK and USA, this is a standard treatment of acoustic neuroma of 3cm or less. 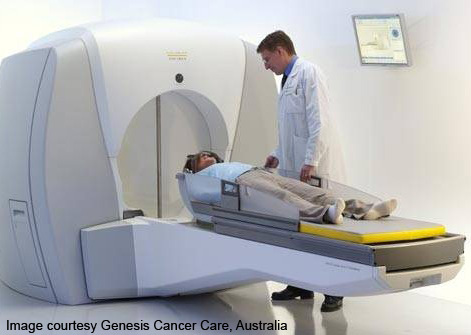 Australia currently has two Gamma Knife installations, one at Macquarie University Hospital in Sydney and the second at the Princess Alexandra Hospital in Brisbane. The Gamma Knife system and treatment is subsided through Medicare, but check with your provider before proceeding. The Cyber Knife, like similarly named 'radiation' based treatment options does not involve or use conventional surgery techniques. It is a non-invasive treatment system and recovery is very quick compared to surgery based treatments. The word Knife comes from the fact that it can treat tumors using focused radiation with the accuracy of a knife. Because of the Cyber Knife's system of operation, it is suitable to treat both cancerous and non-cancerous tumors anywhere in the body, including the kidney, lung, spine, pancreas and the brain. It has become one of the standard radiation treatments for Acoustic Neuroma's (AN) with over 200 installations worldwide. The Cyber Knife delivers high doses of radiation directly into the tumour with a high level of accuracy so that the tumour is effectively treated without damaging the surrounding tissue. This radiation is generated by a compact linear particle accelerator mounted on the end a robotic arm. Being mounted on a robotic arm, the Cyber Knife can move over any part of the body while the patient lies on the treatment table. Like other radiation options, it provides a pain free non-surgical option, especially for patients who have surgically complex tumors or those seeking an option to surgery. Cyber Knife differs from other radiation based treatment systems in that it is a frame-less system which does not require the patient to wear a 'head frame' as a point of reference. Instead a system called 6D or Skull tracking is used to match the location of the tumour to the patients head position. Currently there is only one Cyber Knife installation in Australia. This is at the Sir Charles Gairdner Hospital Cancer Centre in Western Australia. Stereotactic Radio Therapy is a method of radiation treatment that is carried out over a number of sessions. This is also referred to as Fractionated Stereotatic Radio Therapy because the radiation is delivered over a number of sessions (or fractions of the total). Stereotactic Radio Therapy gets it name from the fact that the radiation is provided from many different points around the patient and not from a single direction. Because each beam is focused on one particular point of the AN tumour, the surrounding tissue receives minimal radiation and therefore is usually unaffected. All radiation treatments require specialized equipment and skills to be successfully delivered. As the treatment is carried out over a number of sessions (ie. fractionated), only relatively low levels of radiation are used in each session. It is the cumulative affect of these sessions that provide sufficient radiation to successfully treat the AN tumour. Because the Stereo Radio Therapy is carried out over a number of sessions, repeatability is a key to its success and the patients head position, as well as being held still for the initial treatment, must also be in exactly the same position for subsequent treatment sessions. This is accomplished via a head frame or mask which as well as holding the patients head perfectly still, also provides a point of reference for ongoing treatment sessions. 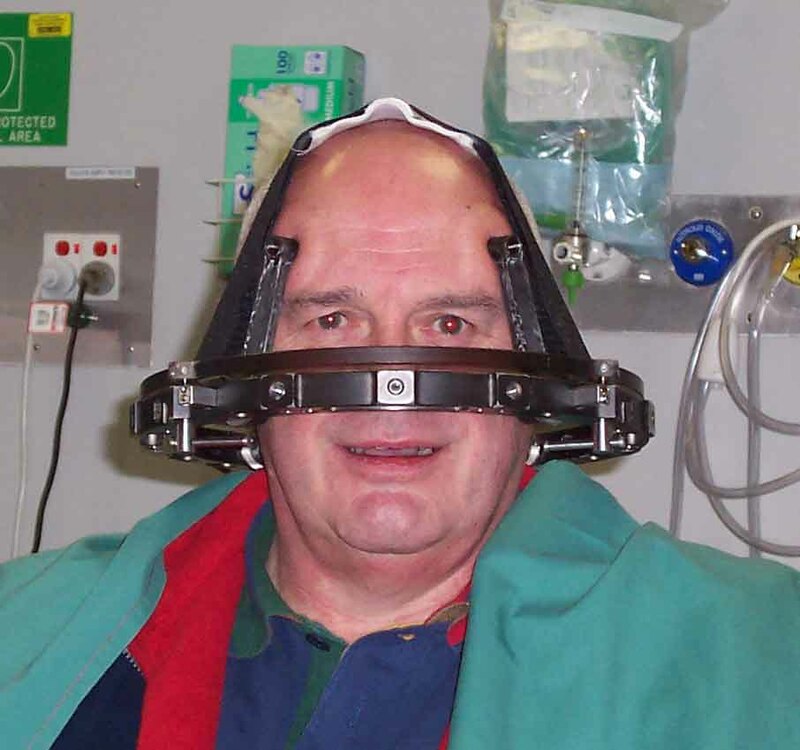 See the section on head frames in the Radio Surgery section. Planning of Radio Therapy is similar to that for Radio Surgery; see the section on Planning in the Radio Surgery section. 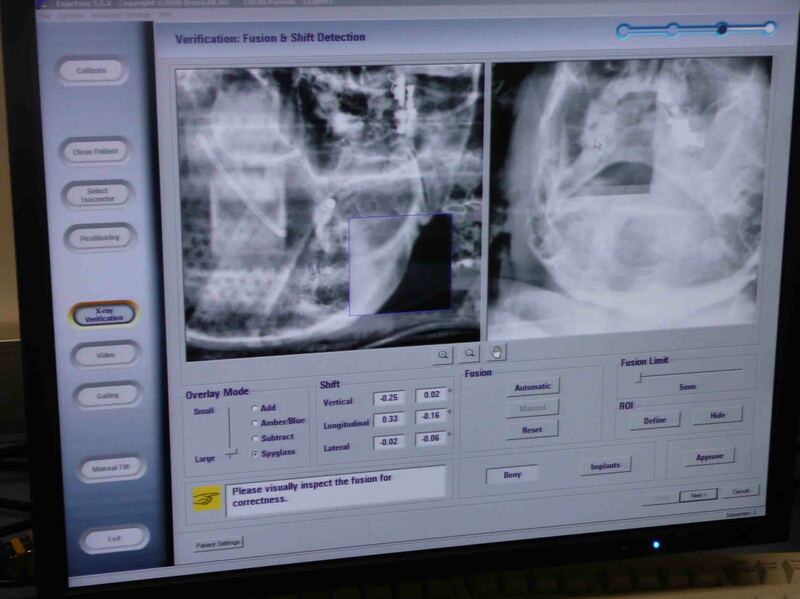 This treatment is only available with systems that use a Linear Accelerator (or Linac) as the source of the radiation.